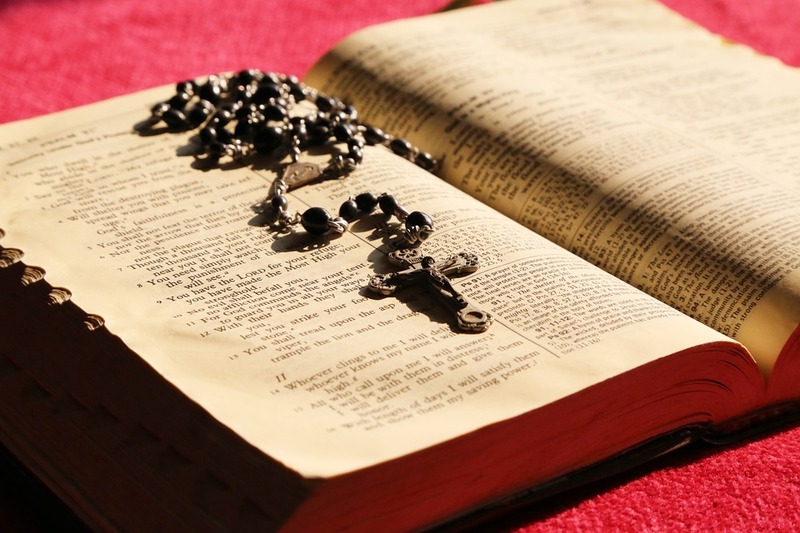 The rosary began as a practice by the laity to imitate the monastic Divine Office (Breviary or Liturgy of the Hours), during the course of which the monks daily prayed the 150 Psalms. The laity, many of whom could not read, substituted 50, or even 150, Ave Marias (Hail Marys) for the Psalms. This prayer dates from as early as the 2nd century, as seen in ancient graffiti at Christian sites. Sometimes a cord with knots on it was used to keep an accurate count of the Aves. One of Dominic’s future disciples, Alain de Roche, began to establish Rosary Confraternities to promote the praying of the rosary. The form of the rosary we have today is believed to date from his time. Over the centuries the saints and popes have highly recommended the rosary, the greatest prayer in the Church after the Mass and Liturgy of the Hours. The most active promoters have been Dominicans. Rosary means a crown of roses, a spiritual bouquet given to the Blessed Mother. It is sometimes called the Dominican Rosary, to distinguish it from other rosary-like prayers (e.g. 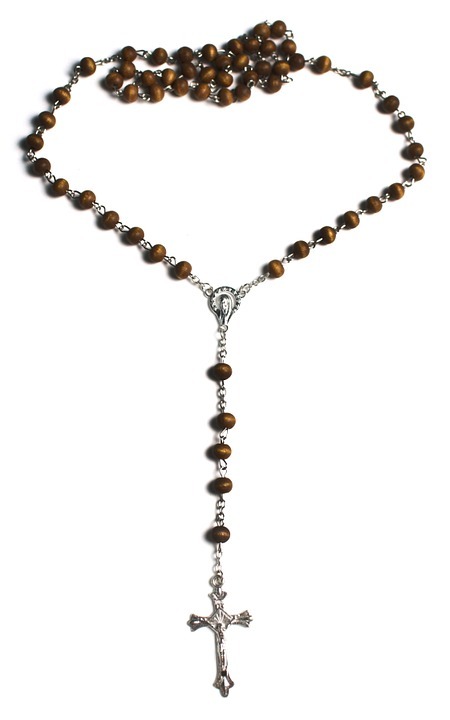 the Franciscan Rosary of the Seven Joys or Franciscan Crown, the Servite Rosary of the Seven Sorrows). It is also, a form of chaplet or corona (crown), of which there are many varieties in the Church. The rosary has been called the preparation for contemplation and the prayer of saints. While the hands and lips are occupied with the prayers the mind meditates on the mysteries of the Incarnation and Redemption represented by the decades. The rosary is a prayer taken directly from Holy Scripture, with the first part of the Hail Mary taken from the words of the Archangel Gabriel, who called Mary “Full of Grace,” and the second part from the lips of Mary’s cousin Elizabeth, who exclaimed, “Blessed art thou among women, and blessed is the fruit of thy womb!” The Holy Rosary is the life and ministry of Jesus, given to us by the Virgin Mary herself for meditation and prayer. The rosary is designed to give yourself to Jesus and Mary, so when you pray each mystery, you make their life your life. When you start the rosary, invite Jesus and Mary to pray with and for you. At that point tell Jesus and Mary that you are aware the beads are actually their fingertips; when you touch the beads you touch them. The rosary needs to be said slowly and gently. You need to be considerate when you say the rosary then you will hear the words of the prayers in your heart. This is one of the most pure forms of giving all your praise to Jesus through Mary. St.Padre Pio said the rosary is a powerful weapon against evil, but it is also our instrument to access the United Hearts of Jesus and Mary. 4th sorrowful mystery in the Domincan rosary Mary meets Jesus carrying the cross. 4th sorrow on the Servite Rosary Mary meets Jesus carrying the cross. “Among all the devotions approved by the Church none has been so favored by so many miracles as the devotion of the Most Holy Rosary” (Pope Pius IX). “Say the Rosary every day to obtain peace for the world” (Our Lady of Fátima). “There is no surer means of calling down God’s blessings upon the family . . . than the daily recitation of the Rosary” (Pope Pius XII). “We do not hesitate to affirm again publicly that we put great confidence in the Holy Rosary for the healing of evils of our times” (Pope Pius XII). “The Rosary is a magnificent and universal prayer for the needs of the Church, the nations and the entire world” (Pope John XXIII). “The Rosary is the compendium of the entire Gospel” (Pope Paul VI quoting Pope Pius XII). “Meditation on the mysteries of the Rosary . . . can be an excellent preparation for the celebration of those same mysteries in the liturgical actions [i.e. the Mass] and can also become a continuing echo thereof” (Pope Paul VI). “My impression is that the Rosary is of the greatest value not only according to the words of Our Lady at Fátima, but according to the effects of the Rosary one sees throughout history. My impression is that Our Lady wanted to give ordinary people, who might not know how to pray, this simple method of getting closer to God” (Sister Lucia, one of the seers of Fátima). “How beautiful is the family that recites the Rosary every evening” (Pope John Paul II). Pope John Paul II has called the Rosary his “favorite prayer,” after the Mass and the Liturgy of the Hours. Pray for us, O’ Holy Mother of God. That we may be made worthy of the promises of Christ. The Rosary begins with the Apostles Creed, followed by one Our Father, three Hail Marys (traditionally offered for an increase in faith, hope, and charity for those praying the Rosary), a Glory Be, and, if desired, the Fatima Prayer. Next come five mysteries, each consisting of one Our Father, ten Hail Marys, a Glory Be, and, if desired, the Fatima Prayers. Conclude with the Hail Holy Queen. Please say a few extra prayers after the Hail Holy Queen for the Pope.